Ever since their invention, drones have seen a rapid growth in their popularity, and guess what? Their popularity will only keep growing. More and more hobbyists and professionals have taken up drones as their number one device of choice for capturing high quality aerial photos and footage, with the DJI Phantom 4 gaining reputation as a reliable professional drone. While shooting videos using the DJI Phantom 4 is a lot of fun, the drone is quite delicate and expensive. It is therefore important to invest in accessories that will keep your Phantom 4 safe during storage and transportation. Luckily, there are a number of options – ranging from military grade carrying cases to backpacks – available for safely storing the DJI Phantom 4 and transporting it from place to place. However, not everyone wants to spend a fortune buying a monstrous hard case, which can be quite a hassle to lug around or carry as luggage on a plane. If you are such a kind of person, then the SmatreeSmaPac DP300 Backpack is the perfect solution. It is a reasonably priced and convenient backpack meant for the DJI Phantom 4. Let’s take a look at what makes the SmatreeSmaPac DP300 really stand out. While the Smatree trademark is a new brand that is not widely known, they have done an amazing job in building this DJI Phantom 4 backpack. 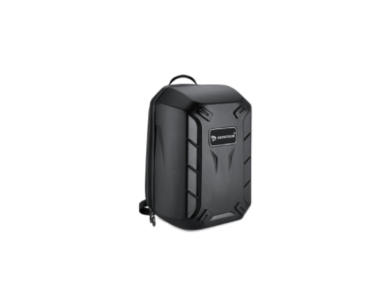 The SmatreeSmaPac DP300 is a well-designed drone backpack that offers ample storage capacity at a very reasonable price. The backpack is light in weight, has been constructed using highly durable canvas and all the features built into the backpack have been well thought out. While it is not totally waterproof, it is made out of water resistant using water resistant material and can therefore be used in rainy or snowy weather. 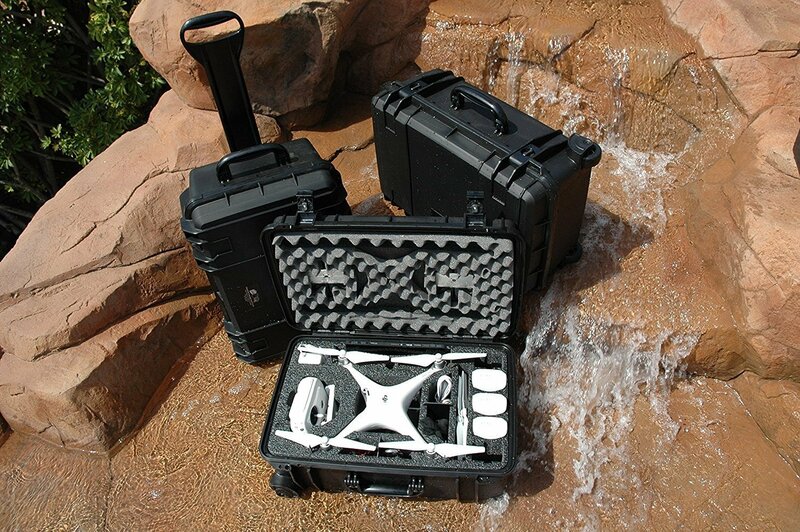 Like most of the drone backpacks available in the market today, the SmatreeSmaPac DP3000 uses the well cut and grooved original DJI Phantom 4 Styrofoam case to keep your drone safe and secure. The Styrofoam case goes into the large main compartment, which is designed in a rectangular shape that snuggly fits the case. It’s important to note that the backpack does not come with the Styrofoam case. Instead, you will have to use the same case that came with your DJI Phantom 4. Fitted on top of the main compartment is a rectangular safe lock which makes it quick and easy to conveniently open both the backpack and the Styrofoam case together as shown below. The backside of the main compartment flap also has a pocket that has enough space to hold a tablet, iPad or any other mobile device (not exceeding 9.7”) to sync with your remote control. The top compartment is designed as the battery hold, with a padded insert that is capable of holding up to four batteries. Unfortunately, the dividers on the insert cannot be removed or adjusted since one side is sewn in. However, the entire insert can be removed to create much more storage space within the top compartment. The SmatreeSmaPac DP3000 also has two deep external zippered pockets which can be used for storing your propellers. Lastly, the backpack has an open and breathable pocket at the bottom of the left side, which comes in handy in case you need to carry a drink with you. The shoulder straps and lower back region are fitted with a light, soft padding that makes the backpack comfortable to carry on light hikes. 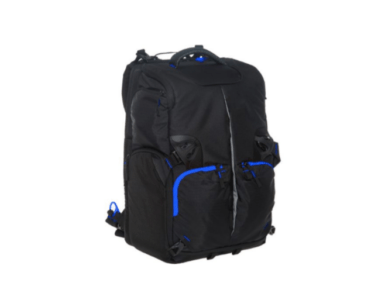 The SmatreeSmapac DP3000 is constructed using a high quality great tear resistant polyester material that gives the backpack a long life of usage. The stitching on the backpack is great, so you are unlikely to have any problems with tearing. Unlike most other drone backpacks on the market, the SmatreeSmaPac DP3000 is also fitted with zippers that operate very smoothly. The SmatreeSmaPac DP3000 is designed for use with the DJI Phantom and should therefore not be used with any other drone models. 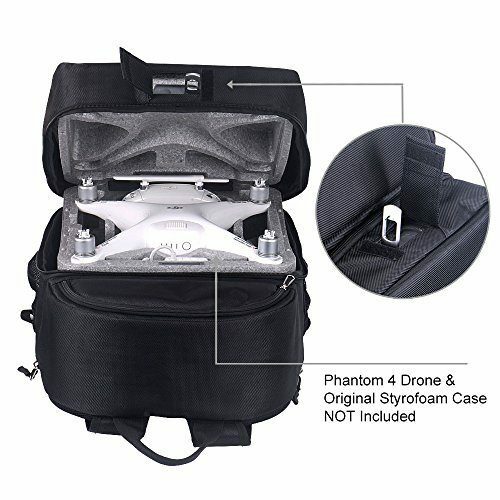 If you have another drone from the DJI Phantom series, I would recommend you look at the Lykus Water Resistant Backpack for DJI Phantom, which fits most of the drones in the DJI Phantom series. It is also worth noting that you cannot carry a laptop or MacBook inside the SmatreeSmaPac DP300. You can only carry mobile devices that do not exceed 9.7 inches. Smatree takes full ownership and responsibility for the quality of their products and therefore, their products come with a full warranty. Should you for any reason feel dissatisfied with the SmatreeSmaPac DP3000, you only need to contact them and they promise to do their very best to quickly and efficiently solve your problem. The safe lock that enables one to open both the Styrofoam case and the backpack is a nice and convenient feature. It makes great and convenient use of its space. It is small and light in weight. It is made of a great tear resistant polyester material, making it quite durable. It is not compatible with other drone models. It does not come with the DJI Phantom 4 Styrofoam case, therefore is not applicable for people who have lost their original Styrofoam case. The SmatreeSmaPac DP3000 backpack for DJI Phantom 4 provides a simple, easy and convenient way for both hobbyists and pros to transport their DJI Phantom 4 and its accessories. The backpack is light, extremely portable and highly durable, constructed with a high grade, tear resistant polyester material. On top of that, it makes great and convenient use of space and comes at a great and reasonable price. All in all, the SmatreeSmaPac DP3000 is the perfect choice for drone enthusiasts who want the convenience of carrying their quadcopter on their back. This Case is Featured on Our Best DJI Phantom 4 Backpacks Article.